-Supports both comercial and residential A.O. Smith gas and electric products. -A range of master parameters in one block may be read or written by configuring a single service object. – May be connected along with ohter modules on the network including local and remote displays and other interface devices. The AIN slave driver uses service objects to define the parameter values to capture from the master (“reading”) and to modify (“writing”). Each device object can access a renge of parameters located in one block on the master device. When reading is enabled, the driver will compare values into the database. When writing is enabled, the driver will generate a write command to the master when data values changes occur in database locations encompassed by a service object. Indicates the nlock number (0…29) in wich the desired parameters are located. Defines the starting parameter number (0…255) for a range of parameters associated with this service object. Defines the number of parameters (1…255) associated with this service object. Defines the database address where the first parameter of this device object will be mapped. The configuration studio will not allow entry of starting address that will cause, the service object to run past the end of the database. The highest calid database address, therefore, depends on the numer of parameters to be accessed. The amount that associated network values are scaled by prior being stored into the databaseor after being retrieved from the database. Upon retrieval from the database, raw data is multiplied by the multiplier to produce a network (to be sent on this device). Similarly, network values (read from the device) are devided by the multiplier before being stored into the database. Check to enable reading (capturing the values of parameters from a broadcast). All read-enabled service objects are used to compare block and parameter number for each master broadcast. Check to enable writing: when values encompasses by this service object change in the internal database these changes will be written to the master on the next poll request. RS485 Serial Protocols: The ANC-300e Gateway has the flexibility to choose Modbus Master/Slave as well as other RS485 serial protocols which include: Modbus Sniffer, A.O. Smith AIN, A.O. Smith PDNP, BACnet MS/TP Client, BACnet MS/TP Server, TCS Basys Master, MSA Chillgard Monitor, DMX 512-Master, DMX-512 Slave, M-Bus Master, Metasys N2 Master, Metasys N2 Slave, Siemens FLN Master, Siemens FLN Slave, Sullair Master, Toshiba ASD Master, Toshiba PLC Master. Ethernet Protocols: The ANC-300e Gateway can communicate with the above RS485 protocols to Ethernet; and Ethernet to Ethernet protocols including Ethernet/IP Client/Server, AB CSP Ethernet Client/Server, Modbus TCP/IP, Profinet IO, BACnet/IP BBMD, BACnet/IP Client, BACnet/IP Server, Baumer VeriSens Client, CC-Link IE SLMP Client, MELSEC Client/Server, Generic Socket Client/Server & GreenFumeHood Client. The Automation Networks ANC-500 PROFIBUS DP-V1 Gateway allows information to be transferred seamlessly between PROFIBUS and RS-485 networks with minimal configuration requirements. 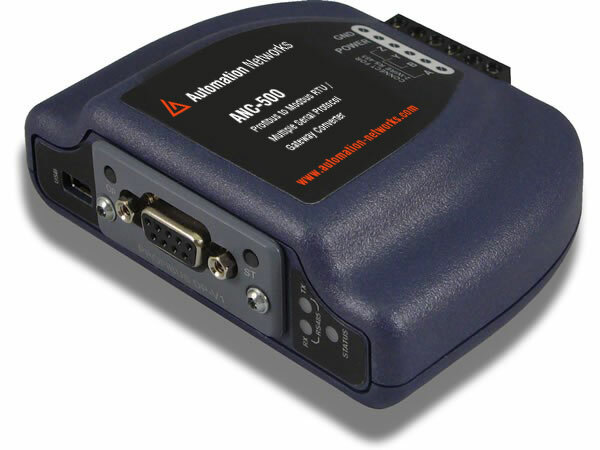 The ANC-550 provides a PROFIBUS port (DB-9 female connector) and an RS-485 port (4-wire terminal block style). The RS-485 port supports multiple protocols. PLC-style logical, arithmetic and filtering database manipulation operations allow the construction of complex autonomous data conditioning functions. The ANC-550 is a part of the ANC Gateway Series product family. The ANC platform is designed to provide a uniform interface, configuration and application experience. This commonality reduces the user’s learning curve, reducing commissioning time while simplifying support. The ANC-550 is a user-configurable multiprotocol Profibus DPV1 / RS-485 communications gateway, which allows seamless bridging between Profibus networks and various popular RS-485 based industrial and commercial communication networks.